I would dearly have loved to provide some up to date photos of the entire collection but my acquisitions have now completely outstripped my ability to store them! At the present moment my desk is absolutely littered with puzzles that I have no space to store. They are absolutely everywhere! I have expanded into the living room (only the most beautiful ones) and also into the dining room (for puzzles that are just too huge). The present Mrs S has actually threatened to come into my study and help me tidy it up! This thought frightens me to death as she may choose to get rid of a few of them! Every year Peter Hajek sends an email to the IPP puzzlers asking for their top 3 acquisitions of the year - he then produces a book giving the results which he distributes to everyone. It makes for a great read and is a wonderful resource for us all. This year his email request set me to thinking about my best puzzles of the year. It has become a bit of a tradition for me to give a summary of my favourite puzzles but I only include the ones that I have both acquired AND solved in the year up to this point. This task is made much easier using my database but on looking back I see that there are a few that I might need to alter my ratings. Almost made it to the top 10 - lots of burrs! During 2014 I developed a very rewarding friendship with several designers and craftsmen who have kept me amused with many burrs. There are so many that I find it impossible to choose any one (or even two or three) that should appear in my top 10 puzzles of the year so I have a few honourable mentions to describe first. 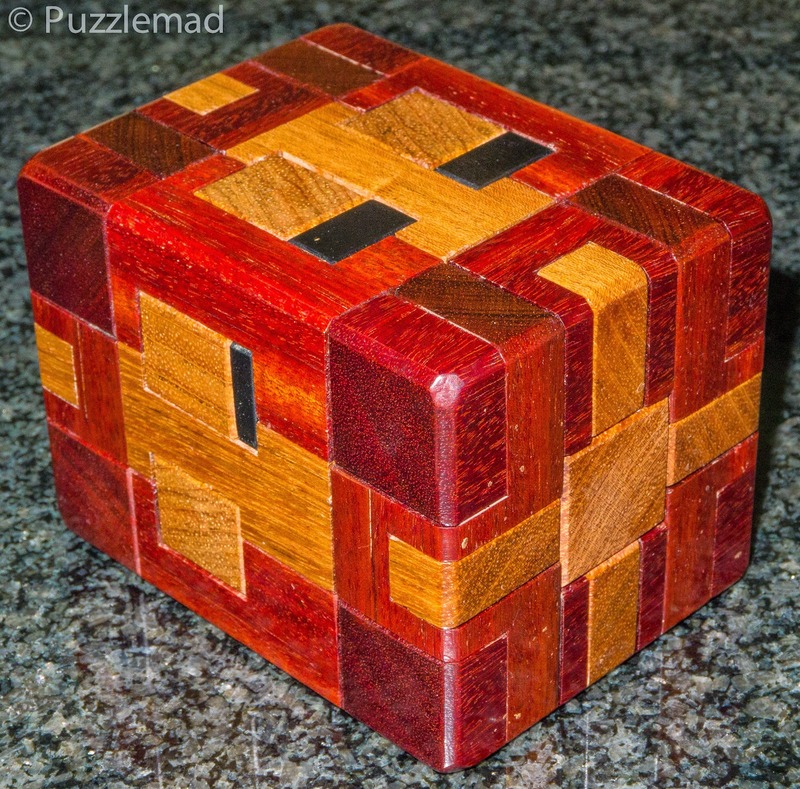 I received both 2013 limited edition puzzles from MrPuzzle just a month ago and have only solved this one so far. It looks just like a 6 piece burr but is actually 12 pieces and solves in a very unique manner. It is not particularly difficult but is extremely clever and a joy to play with. The wood is a much deeper colour than the picture reveals and it still sits next to me to be played with regularly. 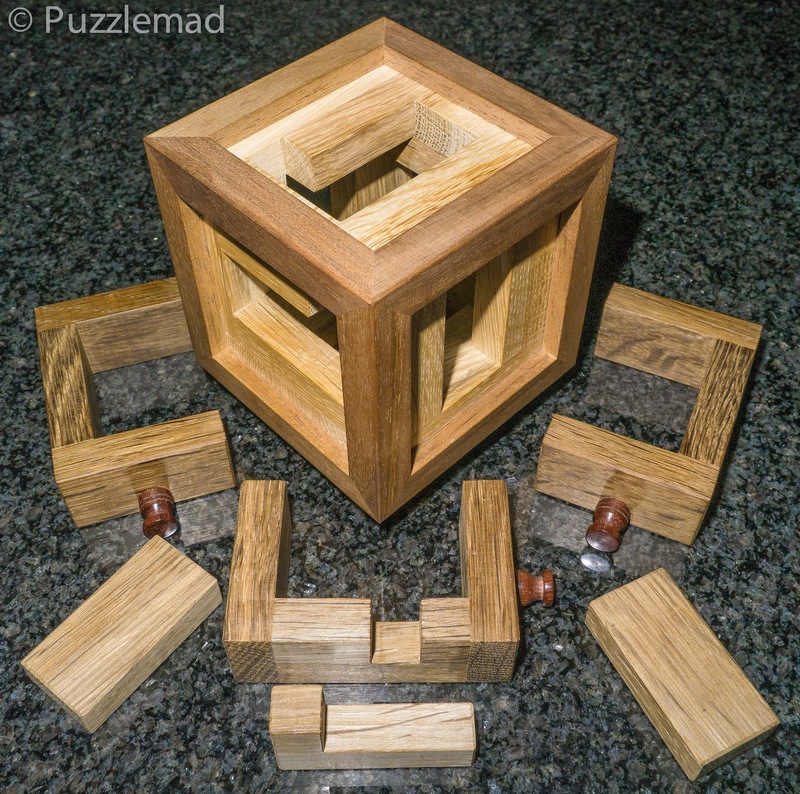 Goetz has produced a page specifically for a wonderful group of puzzles. Both Stephan Baumegger and Alfons Eyckmans have begun designing and making burrs of various sizes that have special shaped pieces hidden inside and the aim is to release those pieces by dismantling the puzzle. Gobi (by Alfons) was special for several reasons - it was beautifully made by Eric Fuller and unusually, it contained 2 pieces to free. What is more appropriate in a desert than a nomad and his camel. The very special feature of this one was that the nomad had to be moved independently within the puzzle at several times to unlock other moves. Eric's superb craftsmanship meant these moves were entirely possible using gravity alone. I actually have several other burrs in this group and all are wonderful. Is it a door or a drawer? 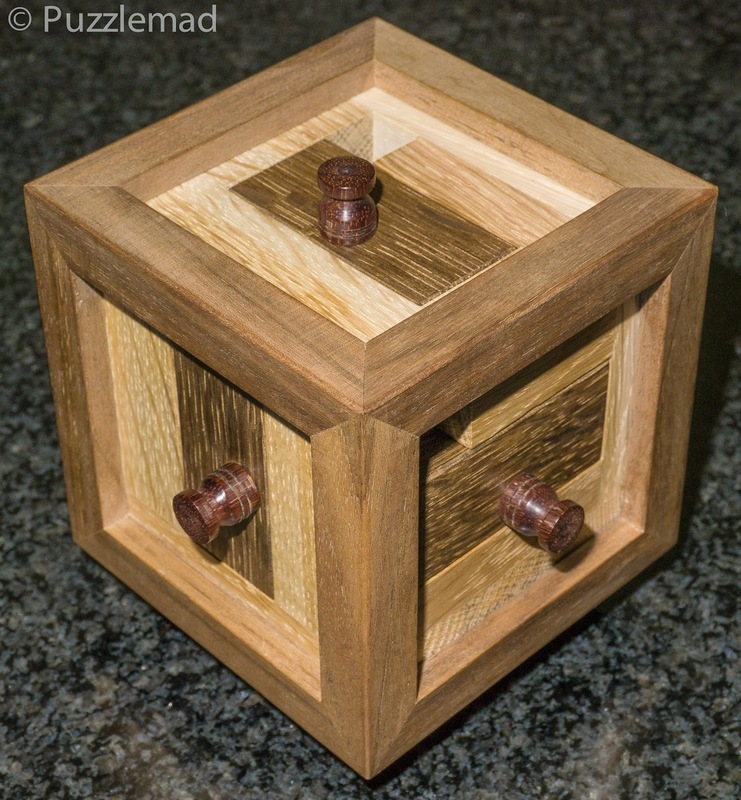 A joint effort by the New Pelikan Workshop under the stewardship of Jakub Dvorak and Mike Toulouzas produced a combination of a framed burr and a packing puzzle. 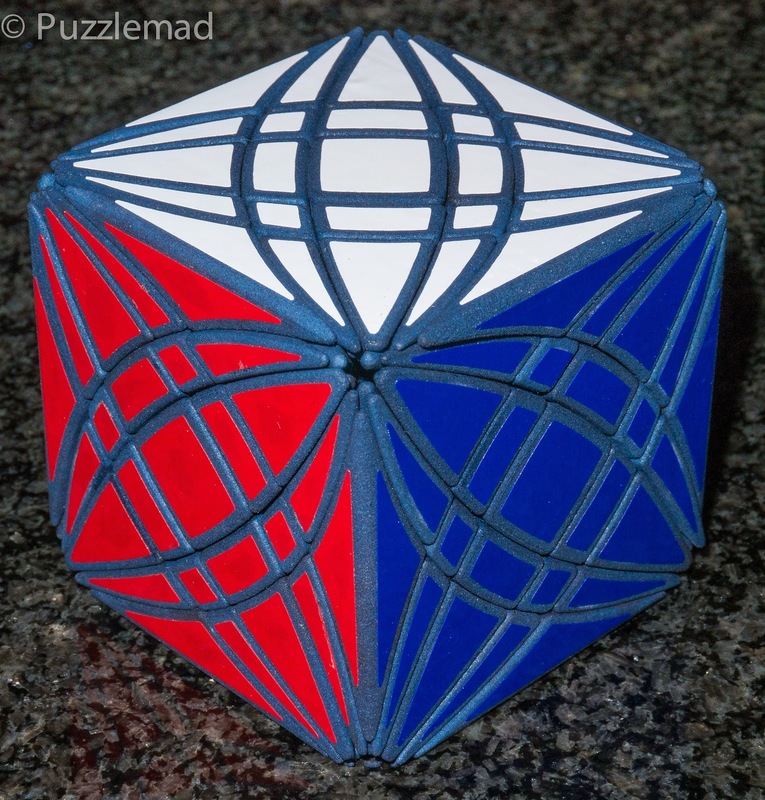 Stunningly made and a joy to solve. Not too difficult but requiring the ingenious use of gravity and friction as well as basic burr solving techniques. My review gushed about it here. .....and now the top 10! Designed and made by Jerry MacFarland. 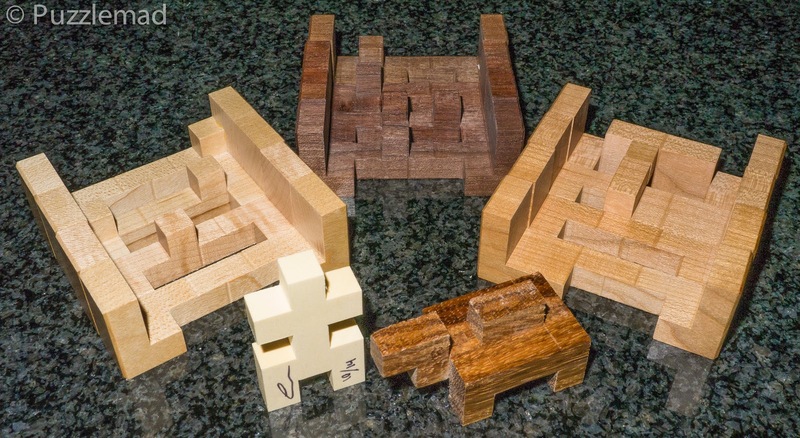 Jerry and I corresponded for ages about the design of these puzzles and this second version that he produced (number one was also fantastic) was something completely different to all of his previous designs. I is a burr with an N-ary element to it and, as with all his work, is just gorgeous! Designed by my friend Adin and exchanged as part of his puzzle by Allard. I am really not very good at packing puzzles and puzzles involving making shapes/patterns. 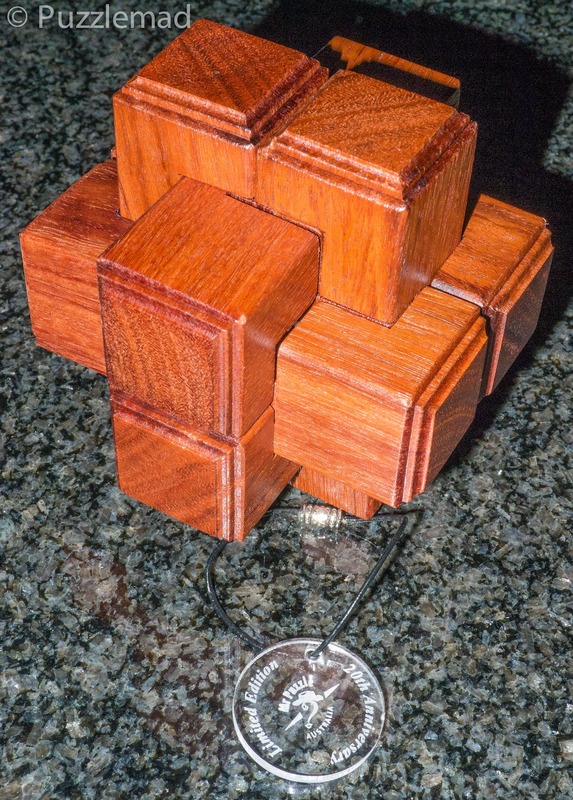 One of the very best puzzles of all time is the Symmetrick puzzle given to me by Tomas Linden of Sloyd.fi which it took me several months to solve. I have carried it to work with me ever since and tortured friends and colleagues. 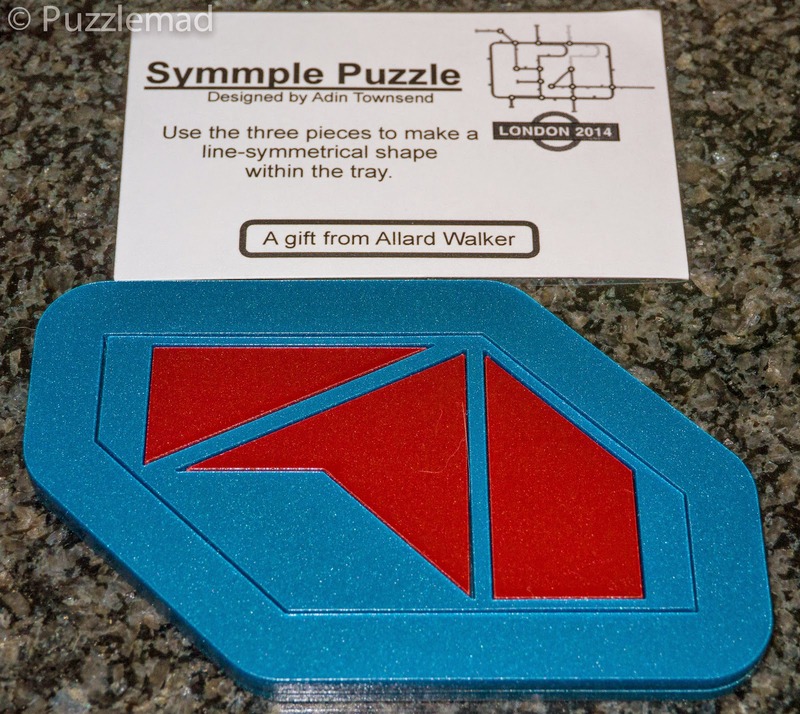 Allard gave me a copy of the Symmple puzzle at the IPP and I was immediately impressed with the shear beautiful symmplicity and yet extreme difficulty of it. So much so, that I blabbed about it here and also have carried it with me ever since. So far not a single friend or colleague has managed to solve it and I've even been asked for the solution by some of the best puzzlers out there! This just had to be in my top 10! 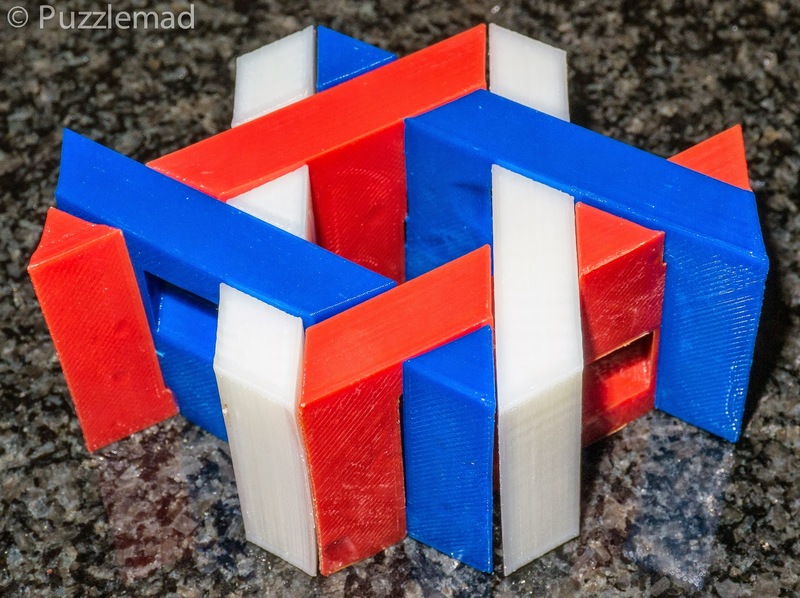 This might well be one of the very last 3D printed twisty puzzles I ever get! 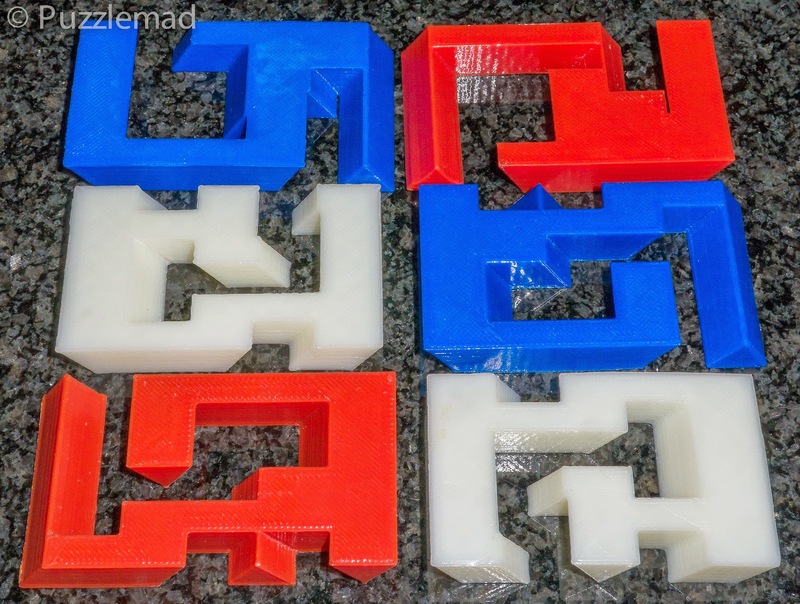 Shapeways have upset the puzzle world with a "priceapocalypse" and now these puzzles are so expensive as to be out of reach to all but the very wealthiest. 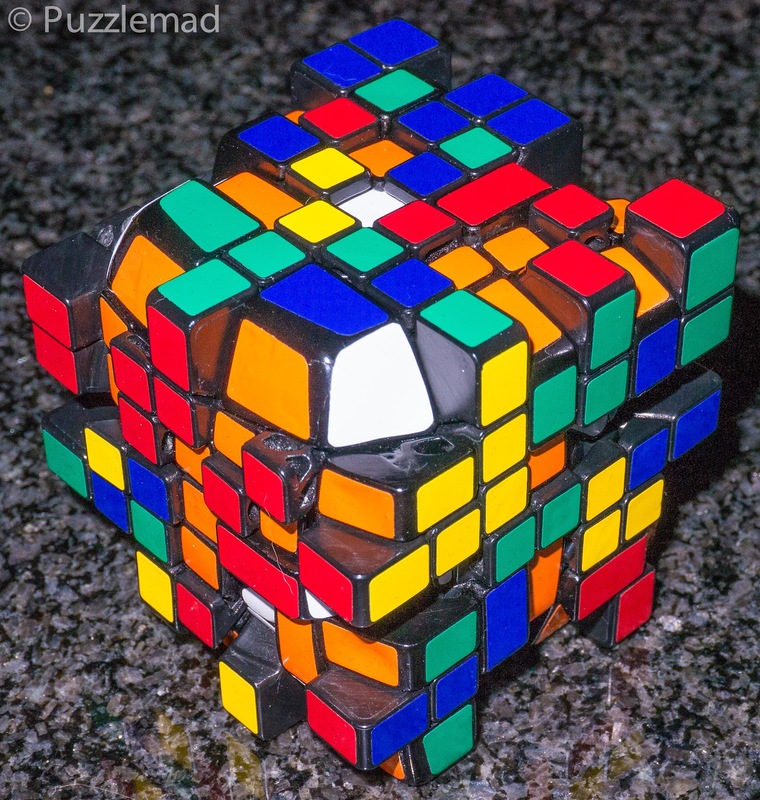 The Rex cube is a fabulous puzzle which requires no real algorithms to solve. I could not resist it when Ben announced that he had designed and made a working "master" version. It is a tremendous challenge that can be solved mostly by intuition but still needs a little thought. I had to include it in my best of year summary! 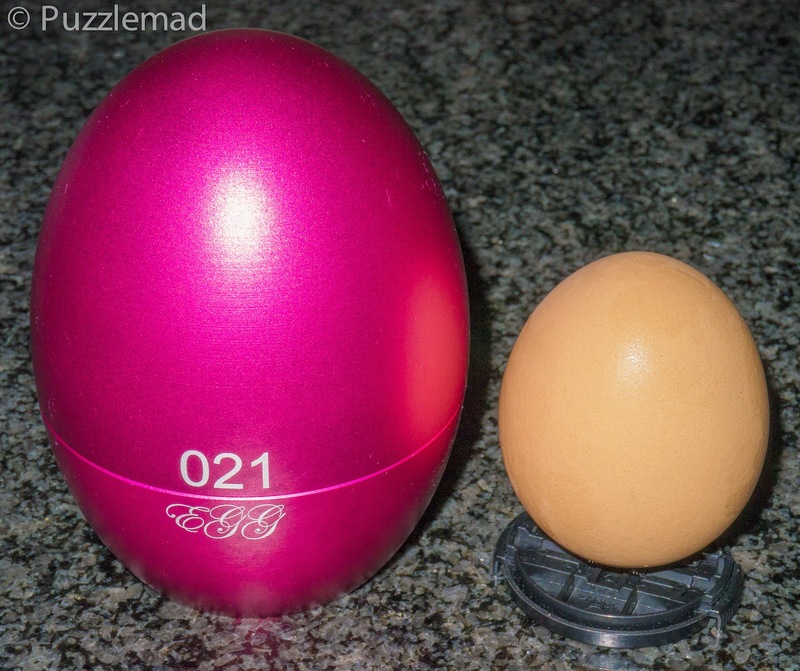 Discussed on the blog here. Designed and 3D printed by my friend, the incredibly talented Steve Nicholls. 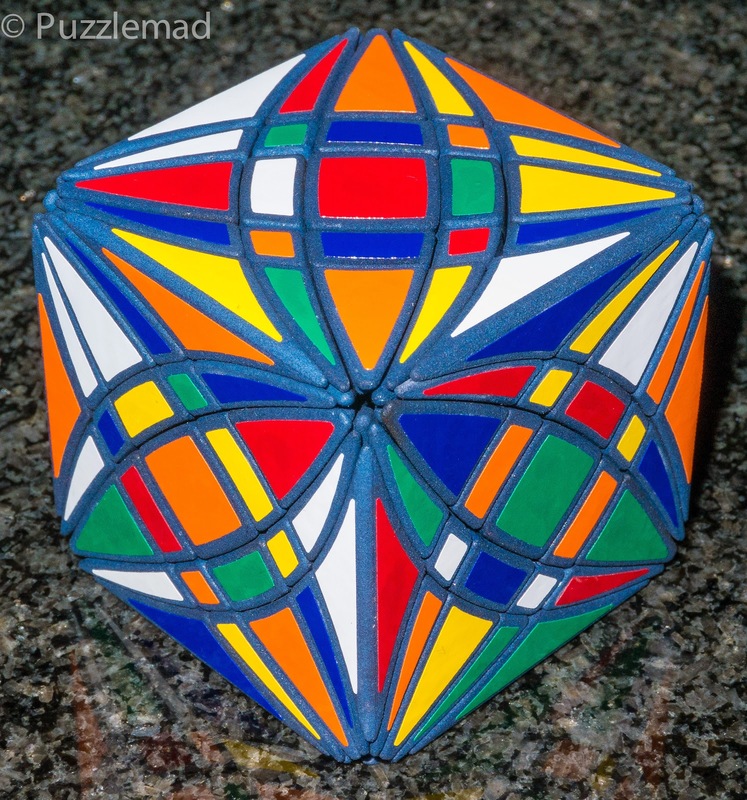 My favourite puzzles tend to be made of metal or wood but sometimes a plastic design is just so amazing that I have to include it in my top puzzles of the year. The Cray twins was a gift to me at the IPP from Steve and it was with some trepidation that I started work on it. I really find burrs a huge challenge and was very worried that something based on anything other than the cartesian grid would be impossible for me. But this puzzle proved to be an absolute revelation, a wonderful pathway of discovery right through to the end. Now all I need is for one of those talented craftsmen to release it in wood! Designed and manufactured by Wil Strijbos. This is a historic puzzle made many years ago by Wil which he recreated for the us this year. It is big and shiny and heavy and drop-dead gorgeous! My best memory from this is managing a sort of raced tandem solve of this with my buddy Shane! The sequence of moves is very well hidden and takes considerable thought (as well as a bit of luck) to open it. Only once open does full understanding arrive and then it is possible to determine the full sequence required to open it every time! Designed by Jean-Claude Constantin and bought from Wil Strijbos. I adore N-ary puzzles but often they can be trivial to solve apart from the risk of getting lost and occasionally can become boring because the process is just mechanical. 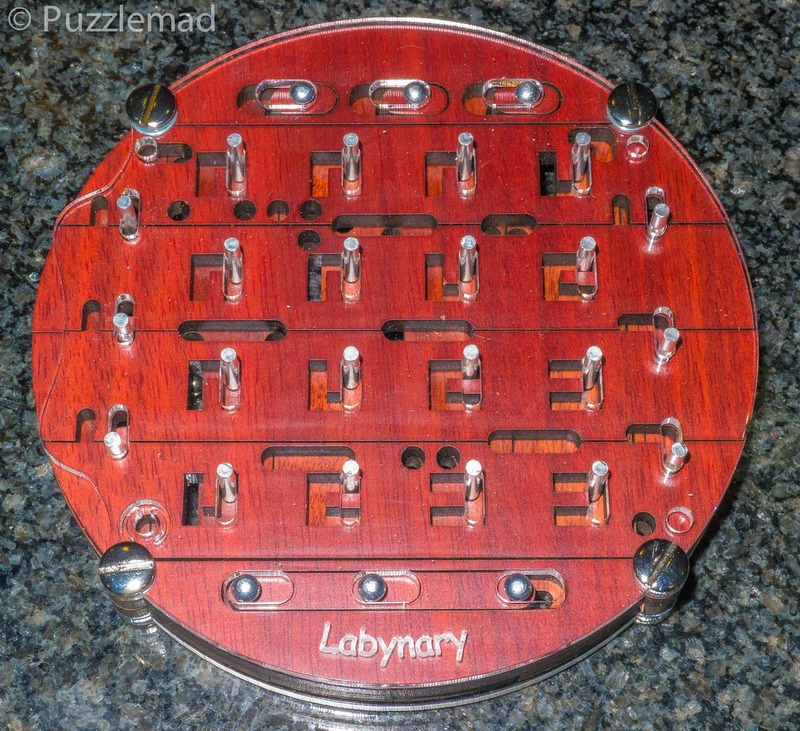 The Labynary is different because it adds a maze puzzle (complete with blind ends) to the basic idea and a hugely long solution process. Whilst the basic moves can be memorised, the need to move a ball bearing through a maze makes the process one that requires a lot of thought and planning for each section of the solve. It is probably the best N-ary puzzle I have ever played with. No summary of a puzzling year could possibly leave out the incredible endeavours of my mate Shane! He often credits me with motivating him and assisting in his puzzle designs and this year he really outdid himself! 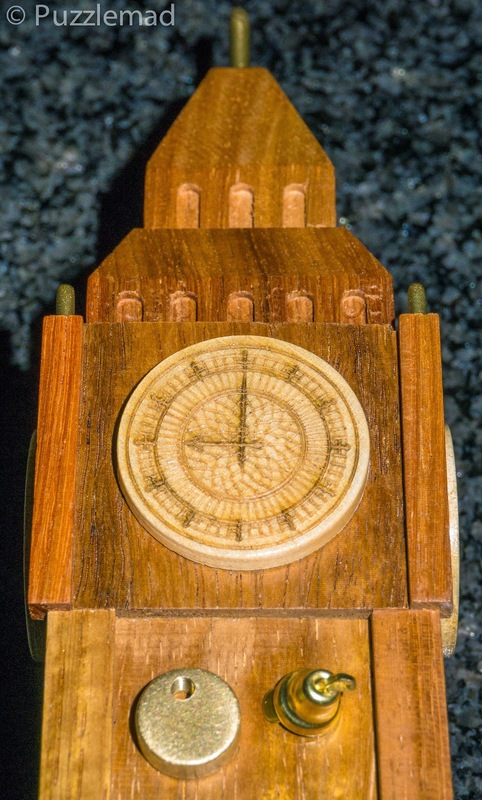 His third design was just stunning in Zebrawood and utilised a mechanism I have never seen before. It took me quite some time to solve and managed to befuddle quite a lot of people at the last Midlands Puzzle Party. Designed and made by Nikos Liapis from Greece. 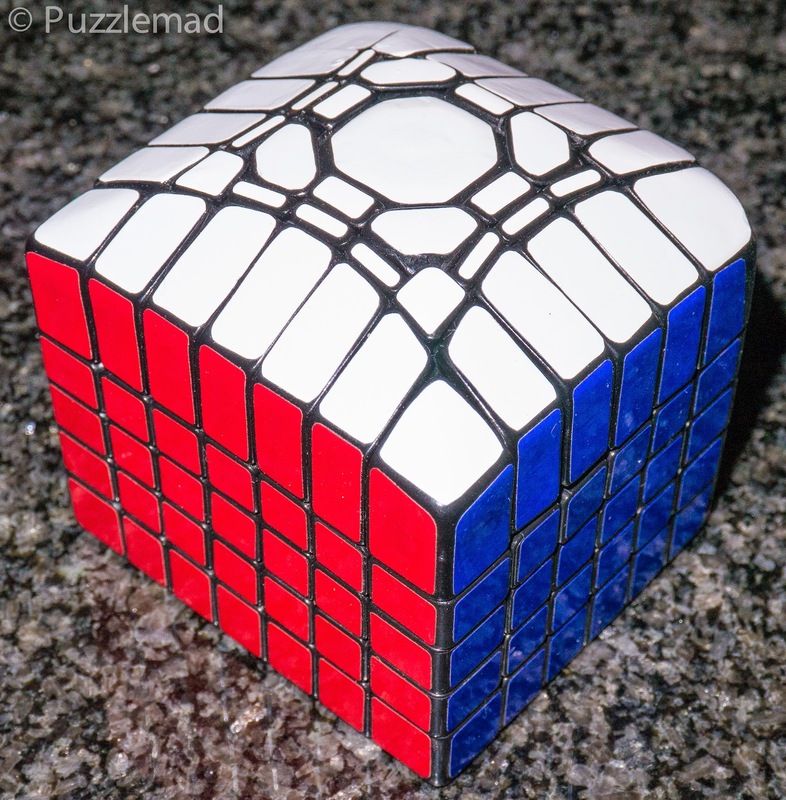 There are literally only 5 or 6 of these in existence and as far as I know, only 2 have ever managed to solve it. An iCube is a modification of a cuboid into an offset Cube which bandages 2 layers together and requires them to be solved simultaneously. 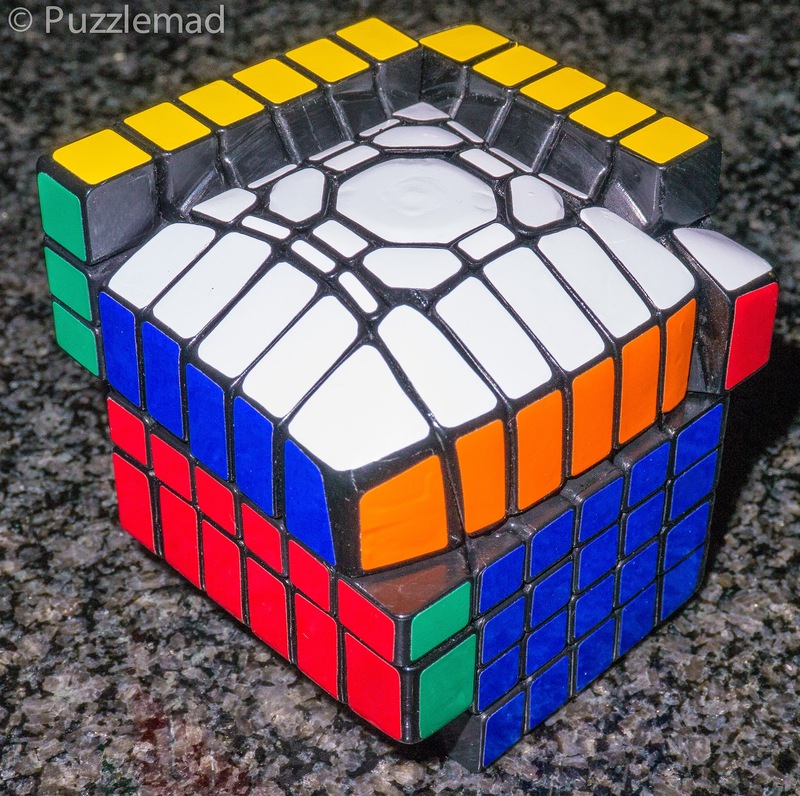 Dan Fast took the original idea further and made a 4x4x5 iCube. Then Nikos went a step further (too far?) by offsetting 2 layers in 2 axes producing a puzzle that gets extremely bandaged! The upshot of this is that no standard techniques at all will allow solution. It requires a very unusual reduction reminiscent of the Bandaged AI cube. A tremendous challenge and beautifully made! Not been fully reviewed but mentioned here. Designed and made by Brian Young and Junichi Yananose. 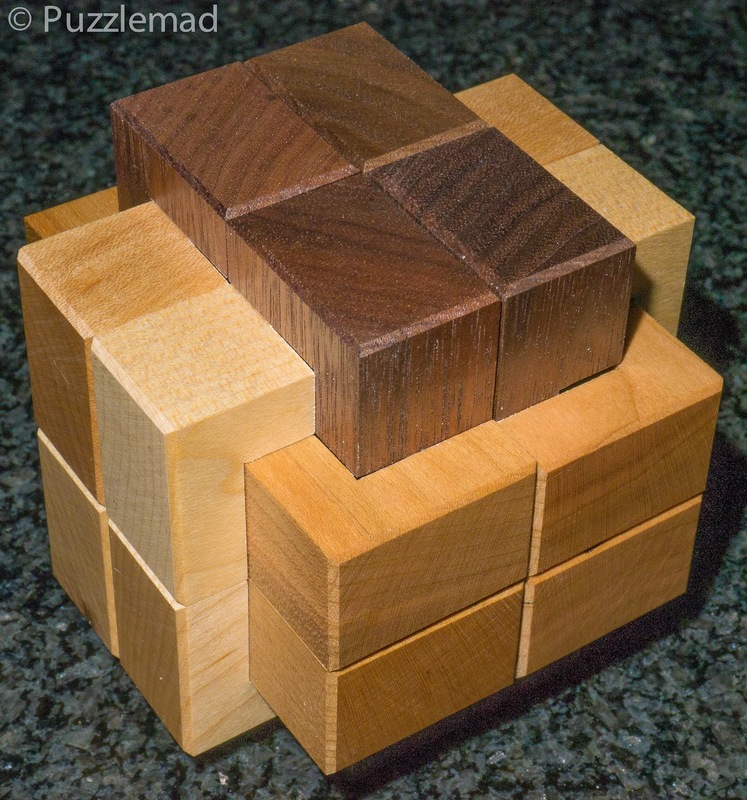 ​This was John Moores' exchange puzzle at the London IPP. My favourite type of puzzle is the sequential discovery puzzle - they combine so many different puzzles in one and produce something which is far more than the sum of it's parts. Big Ben combines the use of simultaneous mazes, manufacturing tools and then working out how to use them all in the iconic shape of Big Ben with 2 challenges within. Plus Brian's workmanship is tremendous as always - how could any Londoner (or even any puzzler) possibly resist? 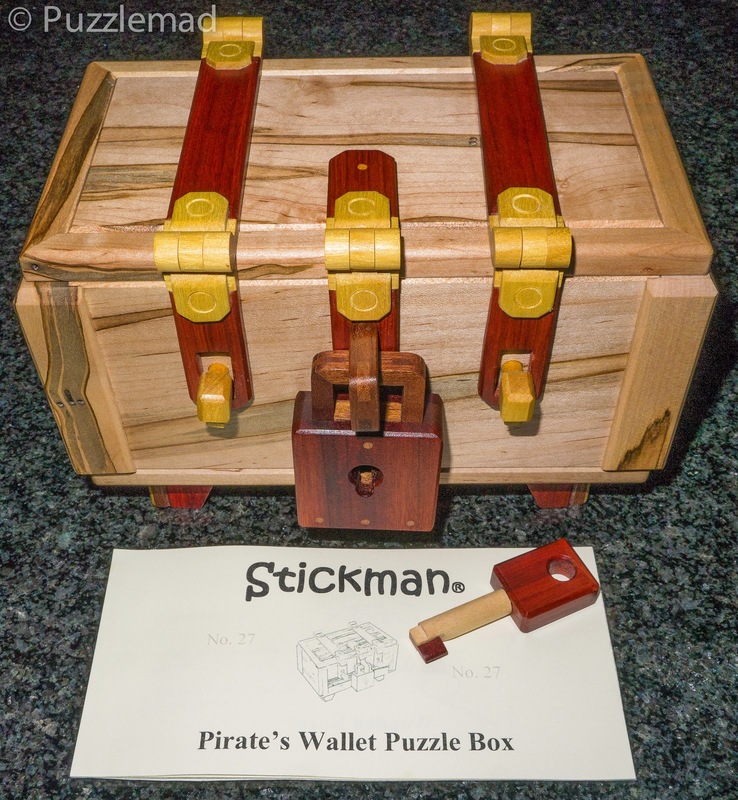 Designed and made by Robert Yarger, aka the Stickman, this combines puzzle box with puzzle lock and sequential discovery puzzle. It is entirely made from beautiful woods and looks absolutely stunning - even my mother, who thoroughly disapproves of my hobby, actually said how beautiful it was. I have said many times that I am not a box collector but when I saw that the lock alone was considered a good enough puzzle to be sold as a puzzle, I jumped at the chance to get the box. A tremendously ingenious sequence of moves using pieces of the dismantled padlock make this my favourite from this year. Incredibly beautiful and an amazing discovery pathway! It sits in pride of place in my dining room on the sideboard. 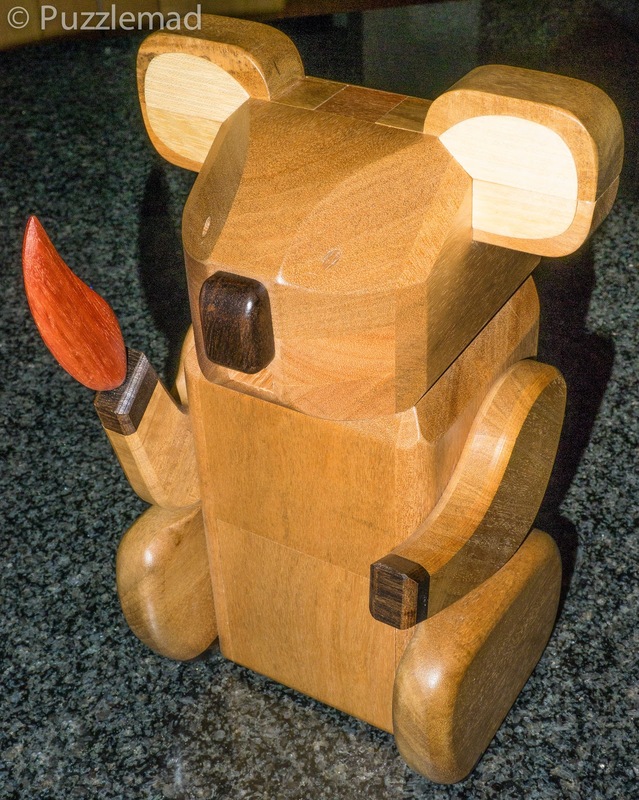 I would have liked to have Katie Koala from Brian Young as my top puzzle for 2014 but only received it a month ago and am still only the first few steps into the solution - this summary is only the best puzzles I have solved in 2014 not just acquired! I hope that I will manage to solve Katie and deliver her joey sometime in 2015 and then I will be able to include her next year. I'm very interested in the Pirate's Wallet puzzle box after reading your blog now. This is such a great summary on the first day of 2015! Glad you enjoyed the summary Otis - Happy New Year!!! The Pirate's wallet boxes are all gone and may go at auction in the future but maybe Rox has a copy for you to play with? Oh yeah, I'll have to ask if Rox has one! Happy new year Kevin! Rox has one Otis. Remind me and I'll bring it along in February when we meet again. Great Post as always Kevin! Hi Shane, happy New Year! You definitely deserve to be up there in my top 10! I really enjoyed my week puzzling on the Parallelogram - and it is still on display in my living room! It is knowing that puzzlers like you are reading my ramblings that keeps me at it! Can't let you down!! Hey Buddy, I'm proud to have made it into your top 10! Thanks again for the fantastic writeup! Just like Shane, it's well deserved! A terrific idea - so simple and yet so bloody hard! It comes to work with me EVERY day! 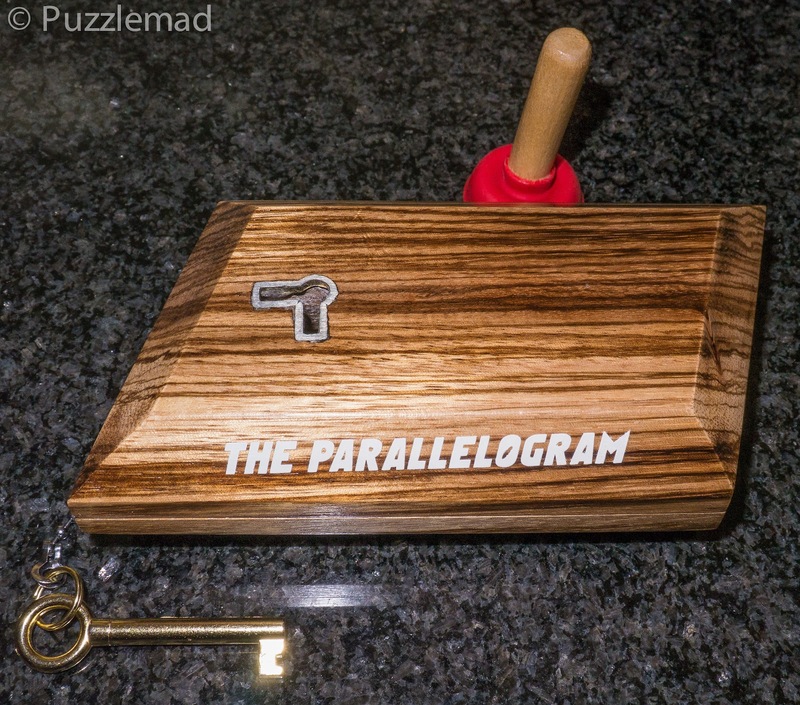 Why is there a tiny red plunger in the photo of the Parallelogram? I went back and read your original post on this puzzle, and I didn't see any mention of the plunger there either?? What is it and what is it for? Hi George the idea is its the "stand" to display the puzzle. You stick it to the back and then it can prop up. Hope this answers your question ! Thanks, Shane, that makes sense! It looks like a miniature toilet plunger, which seemed rather odd to me. How about us mere mortals? Is there any way for us to acquire Peter Hajeks summaries?